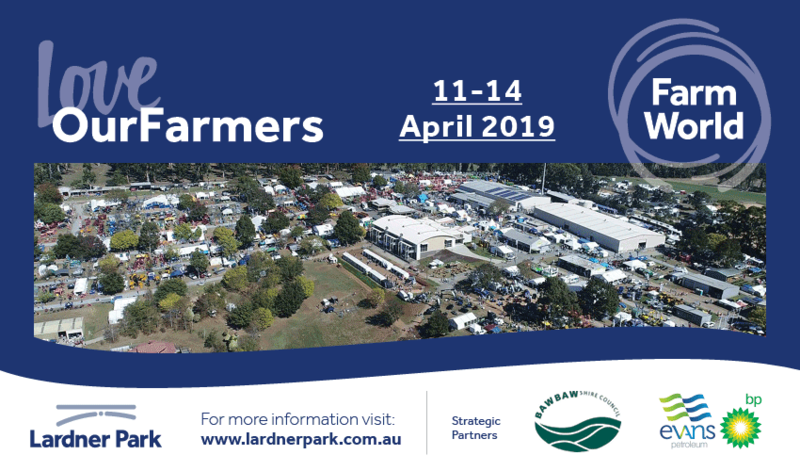 Farm World returns in 2019 celebrating 52 years of tradition at Lardner Park. Recognised as one of Victoria’s premier regional agricultural shows, this iconic event provides a platform to showcase the best of agribusiness, the latest in technology, equipment, and information and provides an ideal opportunity to get up close and chat with the experts. In 2019 we’re celebrating our farming community with a “Love Your Farmer” theme. Throughout the event, you will see a host of activations and opportunities to celebrate the significant contribution our farmers make and the importance of this $13b food & fibre industry. There’s plenty at Farm World for both urban pioneers and lifestyle farmers interested in equipment, DIY passions, sustainable gardening and horticulture, drone innovation, outdoor living and masses of must-have tools. The Telstra Women in Ag lunch, a signature event and highlight for many, will feature a spectacular line up of presenters; and make sure you are there to cheer on participants battling for the crown of Farm Worlds Fittest Farmer. Farm World boasts a huge variety of unique and memorable experiences and value for all visitors including chainsaw carving, 4WD demonstrations, agri-tech zones, cattle dogs, animal nursery, pony and camel rides, live music, food + drink, masses of retail shopping and so much more! Great fun and entertainment for all the family – we can’t wait to welcome you to Farm World 2019. Find out some great tips in a FREE workshop, presented by the Fight Food Waste Cooperative Research Centre in collaboration with Food & Fibre Gippsland – please do REGISTER for your seat and hear from industry expert and CEO of Fight Food Waste, Dr Steve Lapidge about practical ways to make a difference every day. © 2019 Ticketbooth on behalf of The Gippsland Field Days T/A Lardner Park. All sales are final. Tickets are non-refundable.